Ides of March... Don't Sweat It Marty! Let's Have A Party! I am a huge fan of all things Ancient History & The Ides has been one of my obsessions. 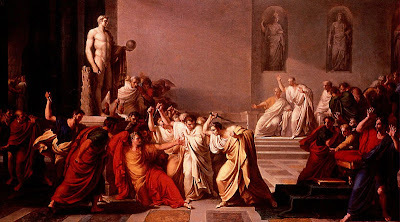 I've always wanted to host an Ides of March party like they do in the House of Yes (love that film). But I've found that there aren't large groups of people who are really into such things. Maybe it's too macabre in general. I think there's a certain charm to the day of doom and going out and doing something, anything that you've never done, may possibly scare you or is outside of your comfort zone. If you crash & burn, blame it on The Ides & if you succeed or just come out unscathed, place your stake right in the heart of Fate & tell her better luck next time. I'm going to have a big Ides of March sale this weekend in my shop & submit a query letter I've been putting off for weeks. So get out there and ask yourself... What would Jackie-O do? oh my gosh, I would've forgotten that today was the big day if you hadn't reminded me! You should have an idea of march party. It'll make you look all so-fish-ti-cated. Idea of March and Jackie O--my brain is still making the leap. I love the idea of an Ides of March party, and a stake in the heart of fate. I've just looked up the House of Yes, as I'd never heard of it and I'm going to rent it! I've also noticed on your sidebar that you are part of the BattleStar Gallactica forum, I LOVE BG!!!!! My boyfriend and I are eagerly waiting for the 'last' series to air in the UK... the cliffhanger of the last one was crazy!! Oh wow..is that what is wrong today!!! We had an internal disaster at my hospital! That actually sounds like fun! But not many people in my area would be up for it, either. Poo. Great post and I completely agree. It's the moments that bring us to our knees, that free us.